← Are You a Person of Faith? It will probably come as little surprise that “Christ” is not Jesus’ last name. But it may surprise some people to know that “Jesus” was not actually his first name either. So what was Jesus originally called? In Aramaic, his native tongue, he would have been known as, Yeshua bar Yosef. Jews of the first century had only one name, plus “son of (his father)”- bar. His father was presumed to be Yosef (Joseph). So how did we manage to get “Jesus” out of “Yeshua”? It became corrupted after filtering through two languages – First Greek (Iesous), then Latin (Jesus). The name, Yeshua, means “rescuer” or “deliverer”. The symbolic name or title, Immanuel as in Matthew 1:22–23 means “God with us”. As for “Christ”, this is a title which simply means “anointed” or “covered in oil” in Greek. This corresponds to the Hebrew, “Messiah”. It is symbolic that his leadership was ordained or blessed by God. It does not necessarily mean “son of God” as seems to be the common misconception. The “Messiah” was expected by most Jews to be a strong military ruler, like David. Many were obviously disappointed. 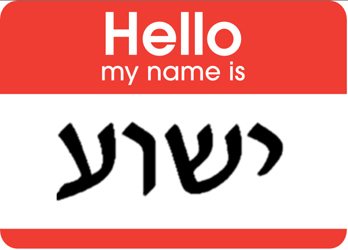 An interesting sidenote: Yeshua/Jesus was a very common first century Jewish name. In fact some ancient manuscripts of Matthew 27:16–17 have the full name of Barabbas as “Jesus Barabbas” and this was probably the name as originally written in the text. Barabbas (bar Abbas) translates as “son of the father”. Early church father, Origen was troubled by the fact that his copies of the gospels gave Barabbas’ name as “Jesus Barabbas” and declared that it was impossible he could have had such a holy name. This entry was posted in Bible, Jesus and tagged Christ, God, Jesus, Jesus Christ, Jewish, Matthew. Bookmark the permalink. Meanwhile, on Earth, a completely different esoteric plane of existence, Father Chuck awoke with a jolt. This time he was sure of it. Oh dear, he’d heard the Voice of God.What had the Good Lord said? Trembling, the little priest smoothed down his mustache. He was not the right man for a calling. Not the right man at all. Kurtis Karr's Blog > Christianity > Bible > What Was Jesus Christ’s Real Name?